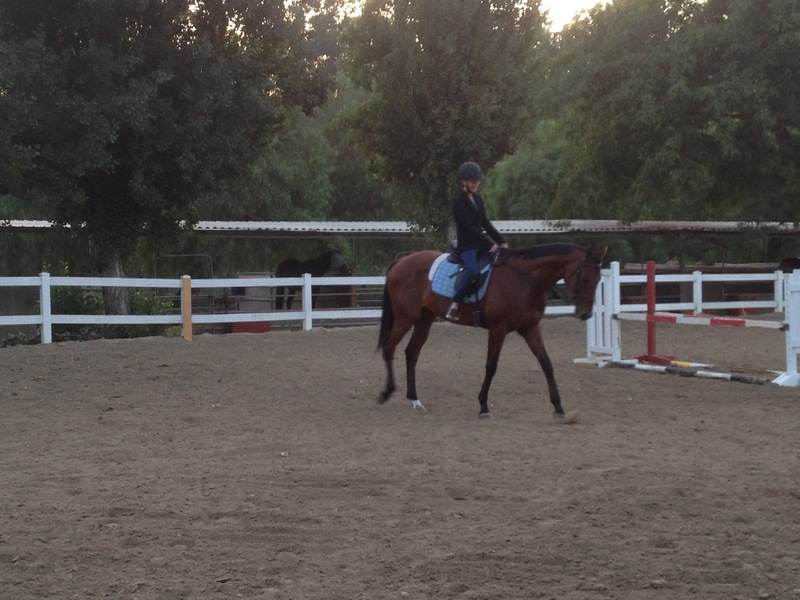 Tonight was our first lesson in a dressage saddle. It went fabulous! Bohemian was very smart and willing, and I have to say I’m pretty proud of myself too – I had a good seat and a good feel. We are teaching Bohemian to accept constant contact with the outside reign while he is figuring out the best place to have his body parts (head down, neck arched, back up, collected body, legs tracking well). We made progress via the normal dressage means: generate forward movement using legs, whip, and loose hips; keep rhythm steady via outside rein squeezes, uberstriken (release inside rein and quickly pat neck) to reward relaxation of his neck, all while maintaining straightness (bending will be added later). We did it all three gaits, both directions, with significant improvement at all stages. The take-away lesson for me is to ask for a good forward gait before asking for anything else. That really seemed to make the difference for Bohemian. I’ve been riding him in a dressage saddle one to two times per week for the last 3 weeks. This photo is from Hemie’s second dressage ride ever: the fabulous Shadney came out and graciously rode him (in her dinner clothes, bless her). In less than 5 minutes, she had him calmly stretching his head down and his back up. It was awesome. She had a super light contact, but with lots of pats and praise she was able to communicate very well with him. Watching good riders on your horse can really generate light-bulb moments. Not the best photo, but I promise they looked great in real life. So, for my dressage rides, I’ve incorporated a good 10 minutes of “long and low” work at walk and trot, where Hemie has figured out to send his head to the ground and his back up in the air. He really responds well to pats and praises – it encourages him to keep trying and prevents frustration. He sometimes gets behind the vertical when I maintain outside rein contact, but I just immediately send him forward while maintaining the connection to correct it. He’s still figuring that one out. Let me tell you, this does NOT exist for saddleseat. At least not with any of the trainers I’ve had lessons from. As a small personal commentary to Karen’s blog post, I think it is great that she found so much training overlap to dressage from her H/J trainer. Almost all eventing and H/J trainers I’ve met say that good flatwork is critical to good jumping. However, while I think the principles of good horsemanship (grooming, nutrition, ground manners, etc) spans all disciplines, the transition from saddleseat to eventing has underscored the very real and substantial differences in riding theory and mechanisms, from rider positioning to the horses’s way of going, that various disciplines have. Karen’s own comparison of the endurance seat to the dressage seat is quite interesting. Some discipline transitions are easier than others. Anyway, back to the diagram! Bohemian and I are starting at the very bottom of the pyramid here. I’m realizing that the “with Energy” below Rhythm is super important. If the horse is doddling along, even if they are relaxed, it is very challenging to develop a good connection. 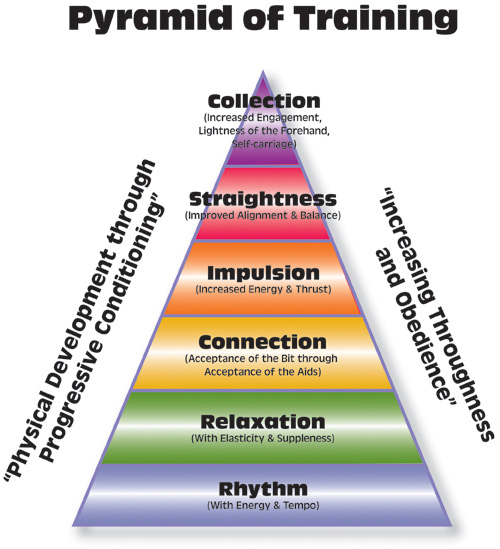 I must mention that the straightness I referred to in our lesson is not the Straightness near the top of the pyramid. It would be better stated as the absence of counter-bending or bending: maintaining a straight line from his poll to his withers, as a strategy to focus on rein contact and ensure he doesn’t move away from impulsion aids. We just barely beginning to think about alignment and balance. To be developed another day. We are doing jumping only in the upcoming Meadows of Moorpark derby, but I do hope I can do both dressage and jumping by the October derby. :) It’s nice to have goals. Nice post, Sarah! With Sydney, my TB, getting energy has been a problem. You described it perfectly: he toddles around which makes it difficult to establish a good connection. I prefer toddling to bolting though so we'll keep working! I had another lesson with Sydney on Wednesday and my trainer was very pleased with how relaxed and giving he has become. We have miles and miles to go, but like you and Hemie, we'll get there. This was a very good post. I like how you described the elements needed for the bottom of the pyramid; I need constant reminders!